I have been slowly putting together what some people call a command centre. 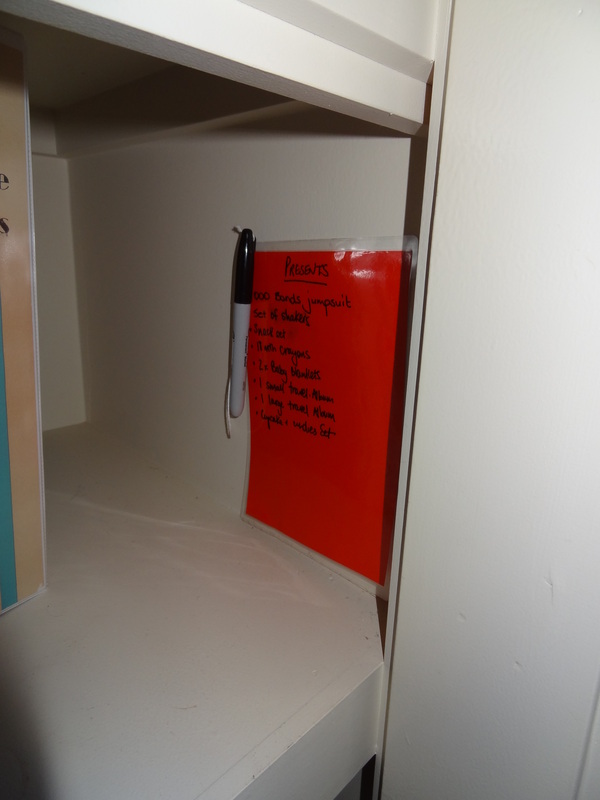 A place to centralise some of the information, paperwork, to-dos, nick nacks and bags to organise the family. My husband since its inception has picked on me mercilessly – “Huston, do we have permission for lift-off?” etcetera, etcetera. Most people put this in a high traffic area like the entrance or kitchen but I have chosen to put mine in the garage. This is the area we enter and exit the home from so it made sense to have this ‘stuff’organised in this location. It is also the only real place where I had the space to put such a centre and it not look too out-of-place. 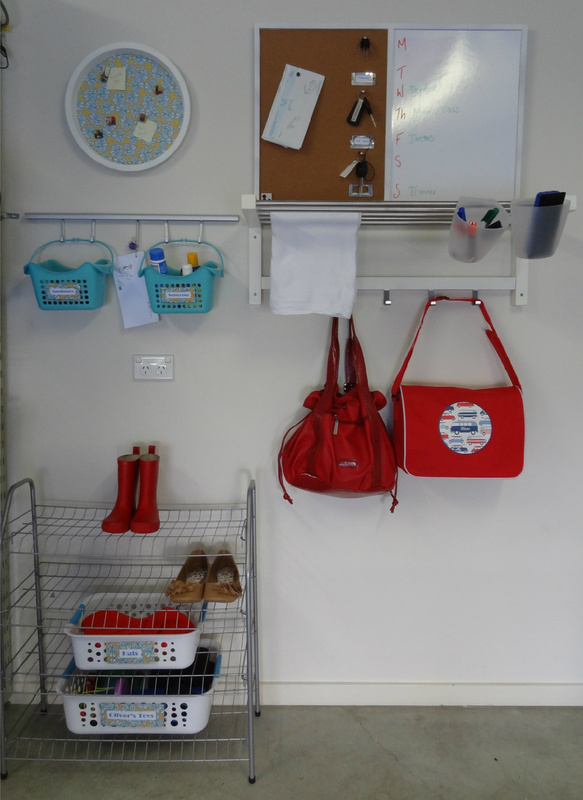 I have mucked around for about a year with a whole host of things here – an old shoe organiser, a large magnetic board, hooks but they all didn’t fulfil the job until I sat down and really decided what I wanted to organise in this space and how best to do it. The Command Centre started with the purchase of the Tjunsig hat rack at Ikea. 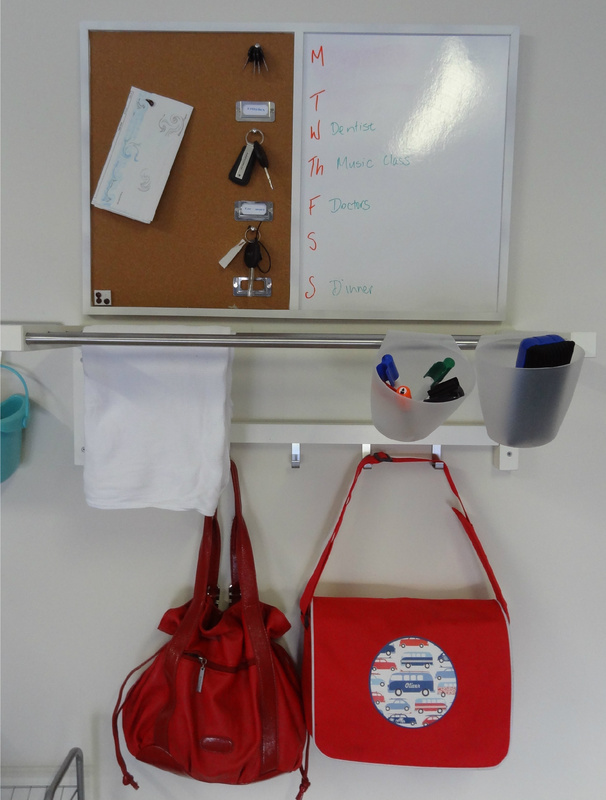 The little hooks underneath are perfect for hanging our bags so they are in easy reach when leaving the house. The rack section on top I have been using to place things I need to remember to take when I go out or I hang the baby’s blankets here to grab when we head out for a walk. I picked up the cork/white board from Kmart for $10. I spray painted the frame white and glued on some label holders and hooks so we had a place to hang various keys of importance. The whiteboard is the perfect size to outline the events of the week and to make note of things to remember . 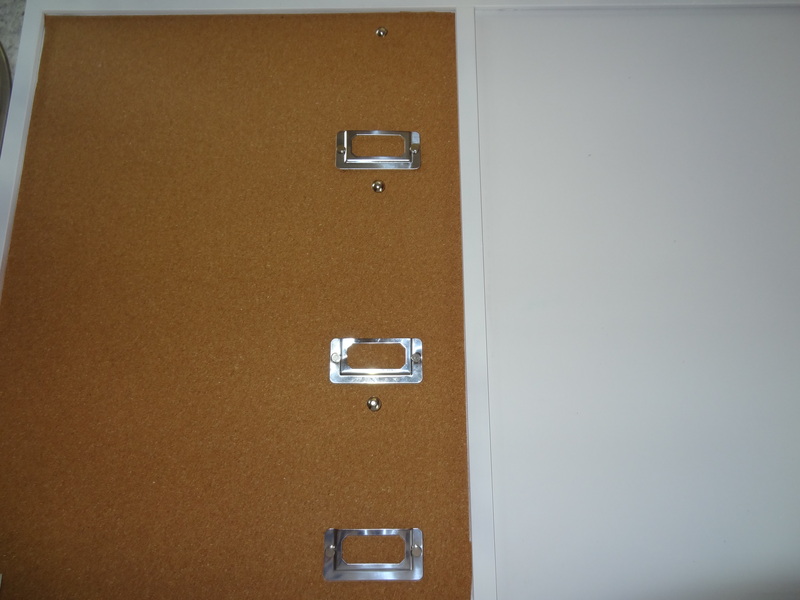 The corkboard is used to keep incoming and outgoing correspondence. I keep the pins, pens and eraser for this board in a couple of Bygel containers from Ikea hanging on the front rail of the hat stand. 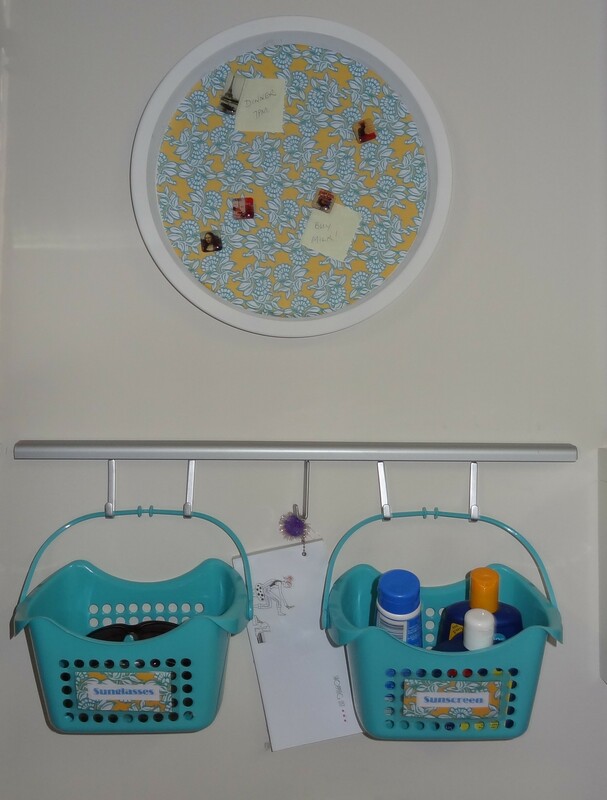 I had purchased an Asker suspension rail and matching hooks from Ikea for a project in the kids’ room but had not needed it so I used this to hold some aqua coloured peg baskets I picked up for a dollar at Target. I have used these to store our sunnies and sunscreen in easy reach when heading outdoors. Also hanging in the centre is the magnetic board for other important notes. I made this board from a pizza tray. It was super easy. You can read how I made this here. I love the paper I have used to complete this tray and the blue in the print matches my peg baskets nicely. As luck would have it, we are improving the storage in our walk-in-robe so we no longer needed the shoe rack in there. Rather than taking it to the dump, it has found a place here for all the shoes that I dare not let come inside. 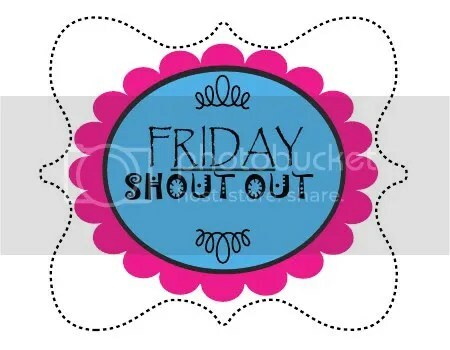 You know the ones – the dirty, the wet and the stinky ones! By adding a couple of baskets to the shelves I have a place for our hats and for some of Master O’s toys that are reserved for when we are heading out. I will write about these soon. So far this is working well for us. It is perfectly positioned so it is the last thing I see as I reverse out of the garage so there is nothing I will forget. It is also the first thing I see as I enter the garage so I don’t forget to unpack the car and put everything back in its place. 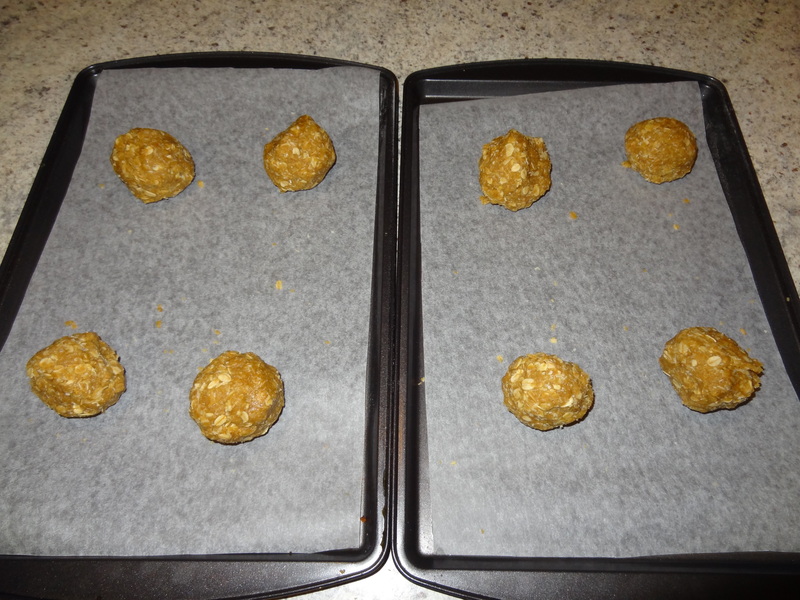 Yesterday I wrote about the ANZAC biscuits 3-year-old Master O and I made. While the biscuits turned out lovely, the cooking experience was not trouble-free. I should have known that cooking at night, after a nap-less day would result in more uncordinated stirring and therefore more spills than other occasions. I did avoid more problems by following some steps which you can adopt too, to make your cooking experiences with the kids more enjoyable. Nearly all my tips revolve around the 5 Ps – Prior Preparation Prevents Poor Performance. It is a motto to live by! 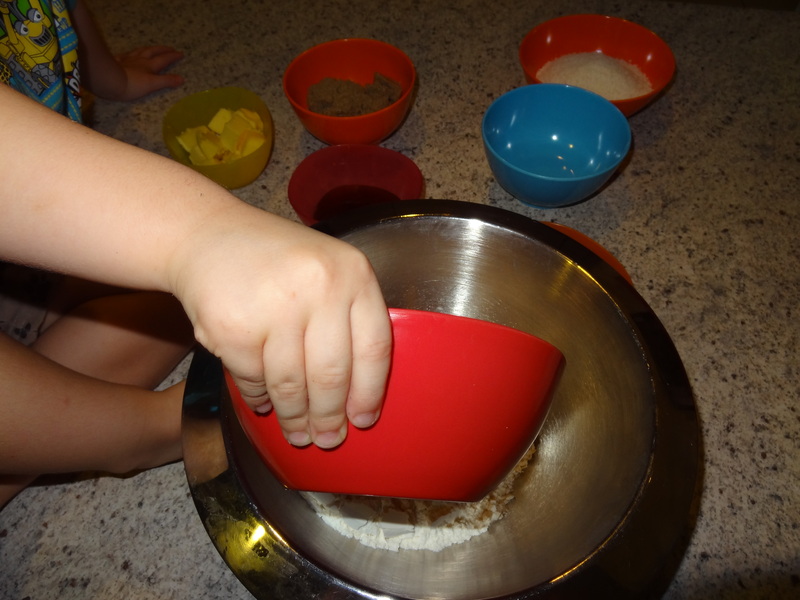 Depending on the age of your child, choose a recipe they are interested in and that is achievable for you both. If they are old enough, get them involved in this process by flipping through recipe books or trawling the internet. 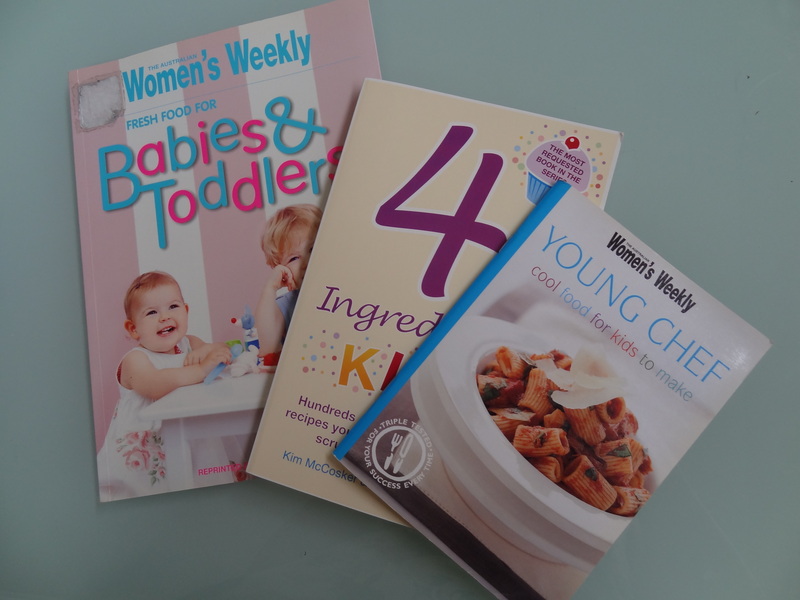 There are a whole host of recipes books out there with kid-friendly versions of recipes for all meals of the day. Gather your supplies to avoid disappointment or an epic fail. If you need to buy something, consider taking your child along to help. Make a shopping list just for them – use pictures of the ingredients for pre-readers. This help build ownership of the project and anticipation. 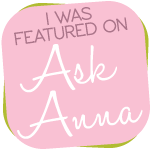 Chat with your kiddo about the cooking experience before you get anywhere near the kitchen. What are you making? What are the steps? What are the rules in the kitchen? What things will they be able to do and what will Mum or Dad have to do? Discussing this helps build the excitement. Prepare the kitchen for the task. Organise a seat or step for your child so he/she can be fully involved. Make sure the kitchen is clean and clutter-free as possible. Believe me there will be mess after the cooking so if you don’t want a breakdown or for your first cooking experience with your kid to be your last, start with a clean slate! Mise en place. Just a fancy French word for getting your ingredients together – measured and prepared before cooking. Depending on how old your child is can determine how you do this. If they can read they can help you gather the ingredients by going through the recipe. They might be old enough and interested enough to measure out and prepare the raw ingredients – or maybe only some of them. 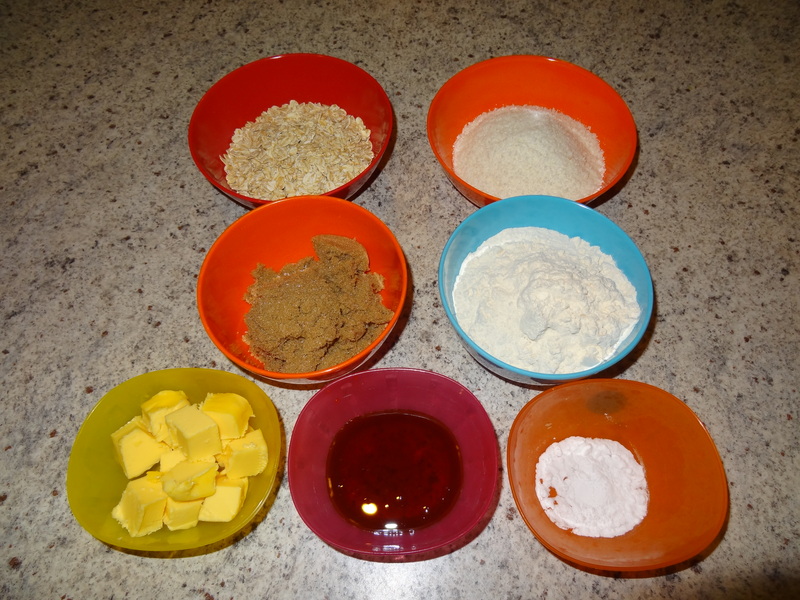 My 3 year old, depending on how involved the recipe is, gets fidgity, so I will often measure and prepare all the ingredients before he comes into the kitchen so he can just get on with the job of cooking. Share your creation with family and friends. What satisfaction it gives a little one to tell others that they made it. Even more importantly, what a great lesson this is for kids in giving and sharing. 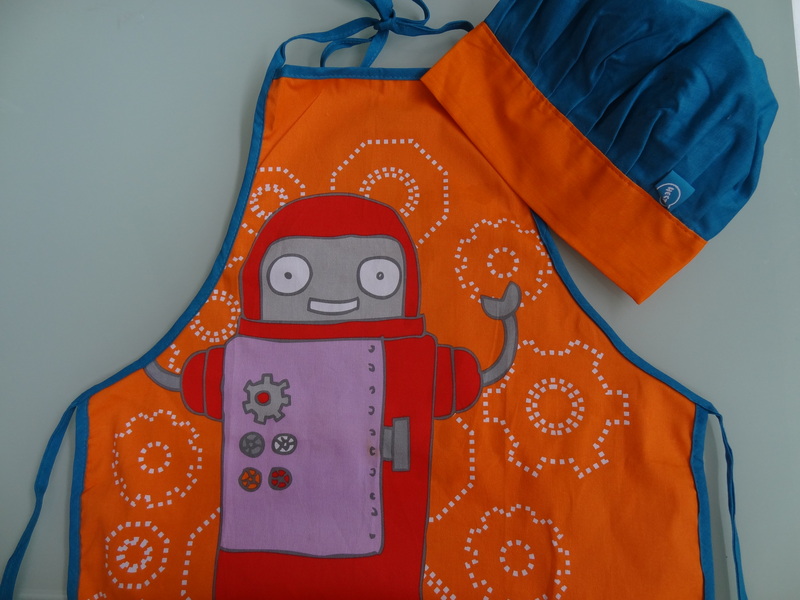 Have fun cooking with your little ones. Today is ANZAC Day. For those of you who are not Aussies or Kiwis, it is a day of remembrance for the sacrifices of our service men and women in war. It is held every April 25th, the Anniversary of the 1915 landing of our troops at Gallipoli, Turkey during the First World War . It is significant as it was the first major military action of the Australian and New Zealand Army Corps (ANZACs). 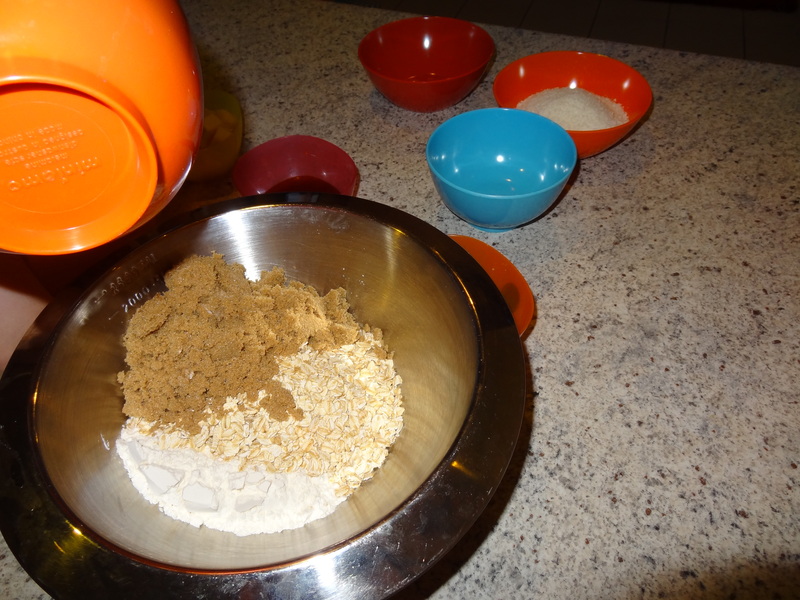 It is tradition in many families at this time fo the year to whip up a batch of ANZAC biscuits (cookies). These oat and coconut flavoured yummies were considered to have good nutritional value and remained relatively fresh during the long voyage from Australia to Europe. Enough of the history lesson for today. Can you tell I am a History Teacher? Last night Oliver and I whipped up a batch of giant ANZAC biscuits so I thought I would share with you the recipe we used. It was based on a Super Food Idea’s recipe which you can check out here. 2. Sift flour into a large bowl. Stir in oats, coconut and sugar. 3. 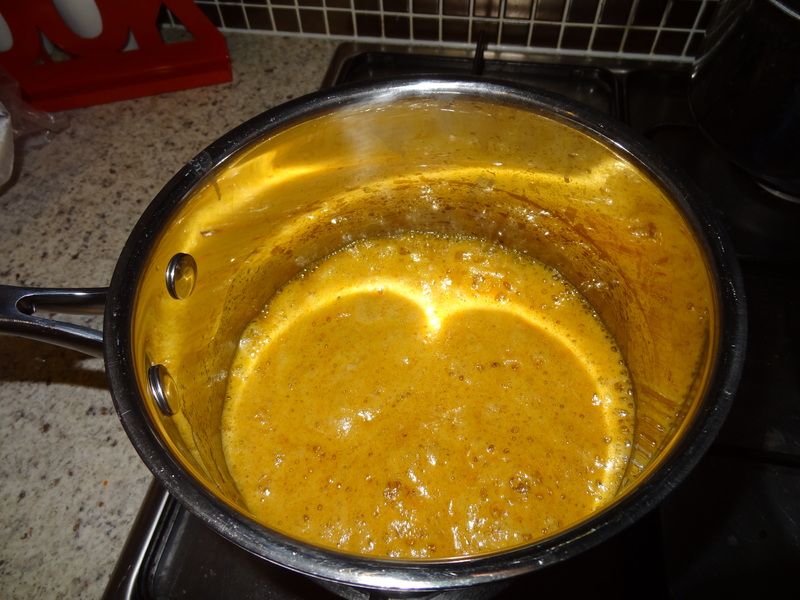 Place butter and golden syrup in a small saucepan over medium-low heat. Stir until melted. Remove from heat. Combine bicarbonate of soda and 2 tablespoons water in a small bowl. Stir into golden syrup mixture (the mixture will become frothy). Add immediately to flour mixture and stir until well combined. 4. Roll mixture, just less than a 1/2 cup at a time, into balls. Place 4 biscuits on each baking tray. Flatten to about 12cm (diameter) round if you like your biscuits hard, 10cm if you like them chewier. Make sure you allow room for biscuits to spread. Bake for 15 to 18 minutes (a few minutes less than this if you like them chewy), swapping trays after 10 minutes, or until biscuits are golden. Allow biscuits to cool completely on tray. I decided to alter the ingredients and processes a little from the original recipe to get a nicely formed biscuit. Using their measurements the mixture was just too dry to form into balls that wouldn’t fall apart when flattened. In investigating the review of the recipe I chose to put in a little more golden syrup to give the biscuits a real authentic taste. The recipe originally said use 1/4 cup of mixture for each biscuit but by the time I rolled 8 as suggested there was still more than 1/2 of the mixture left in the bowl. Using a 1/4 cup would make a nice sized biscuit, but a 1/2 cup will give you some awesomely sized ones! I made slightly smaller and thicker sized biscuits and they turned out just as I like them, crispy on the outside with a chew-ish centre. 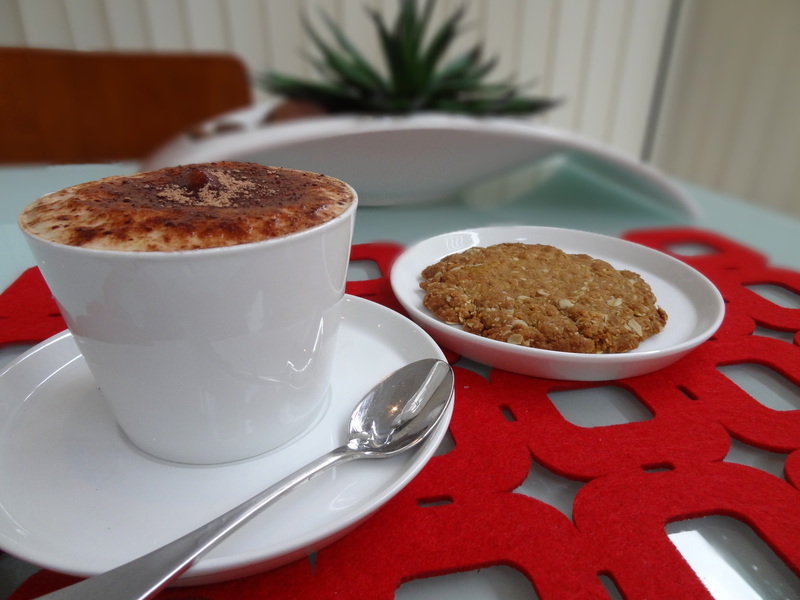 Fire up the coffee machine – its bikkie time. 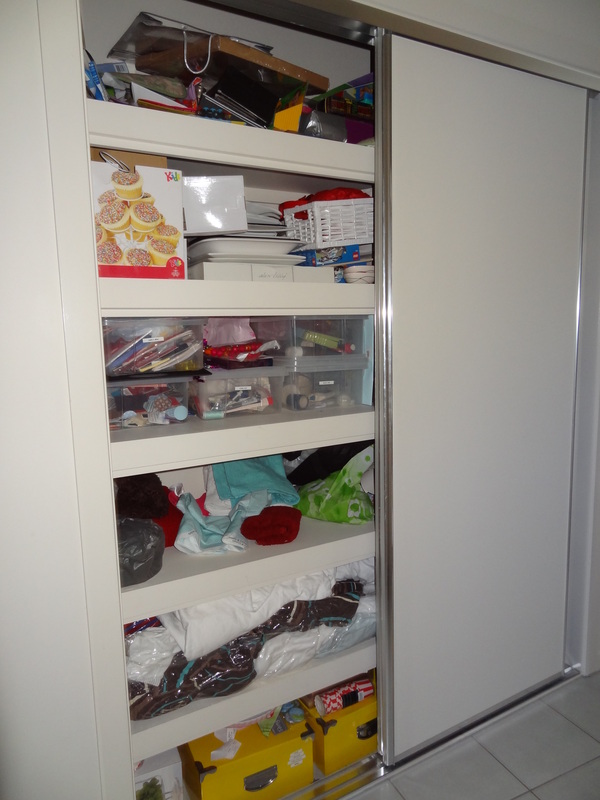 Yesterday I wrote about the clean up and organisation of my hall cupboard. You can read about that here. While that area of my home is now spanking clean and neat, my dining table has become a bit of a standby zone for all the craft projects I had neglected and stored in the recesses of that once messy cupboard. Riding on the high of organising one area of my home, I have jumped head first into a collection of projects and today I can share with you one of my favourites. It is so easy and looks so effective I know you will want to do it too. 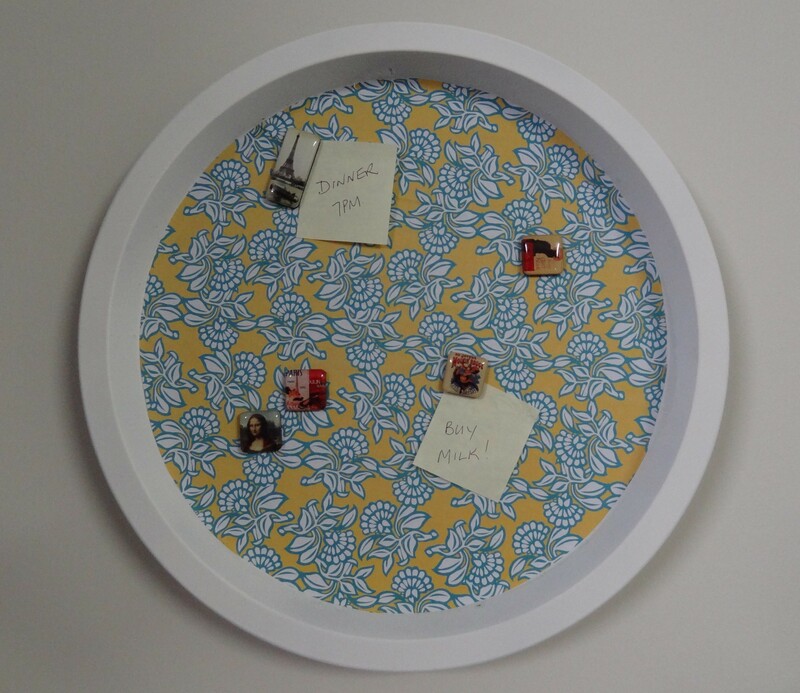 I stumbled upon the idea of turning metal pizza or biscuit trays into magnetic boards months ago. 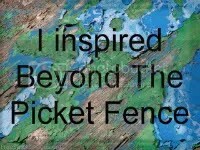 It was long before I had pinterest and during my pregnancy brain days so unfortunately I have lost the link to the original project I admired. Sorry. Fortunately it was so simple there was no way I was going to forget how to replicate it myself and here is the process for you to make your own. 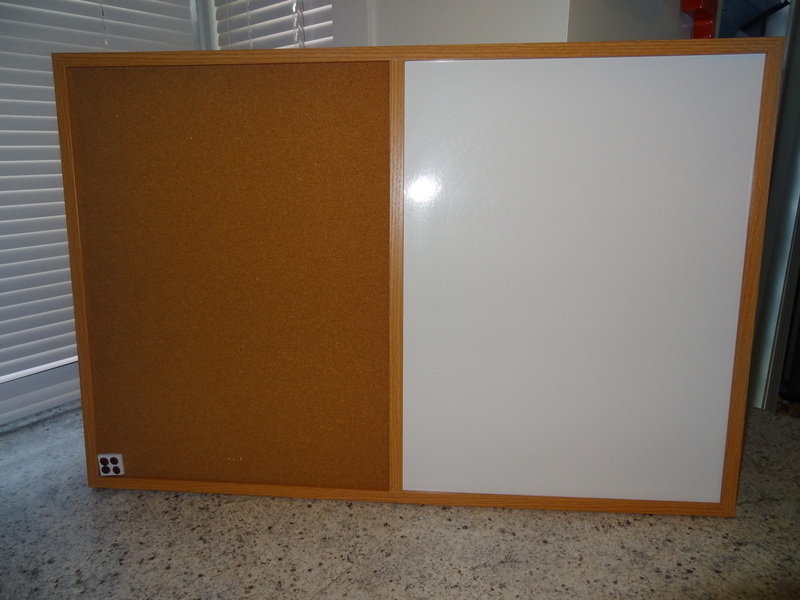 Step 1 – Choose your would-be magnetic board. You can use any size or shape metal tray for this project. 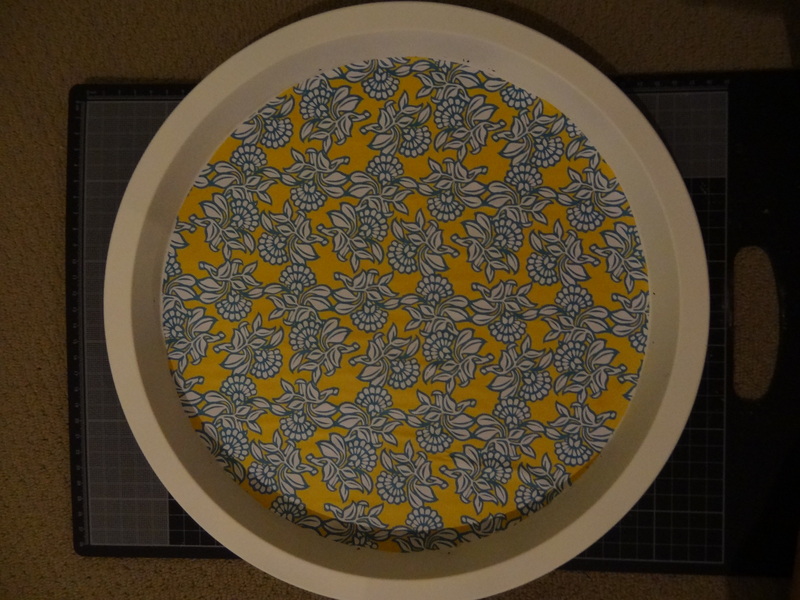 I used a pizza tray that cost a few dollars in Kmart – sorry I forgot to photograph this! Keep an eye on the sales or the discount variety stores and you will be sure to pick a tray up for next to nothing. Using a paint primer, prepare your tray to be painted. You don’t need to cover the whole tray. I used a can of paint primer I had left over from another project and did not bother to paint the very back of the tray as it was to be attached to a wall. I only primed the edges and some of the base of the tray’s top side. You will see why soon. Top your primer coat with as many coats of your final colour as you think you need. I used two coats of white spray paint, also left over from another project. While you could use a paint brush to apply your colour, especially if you have a speciality colour in mind, I prefer the ease and neatness of spray paint. 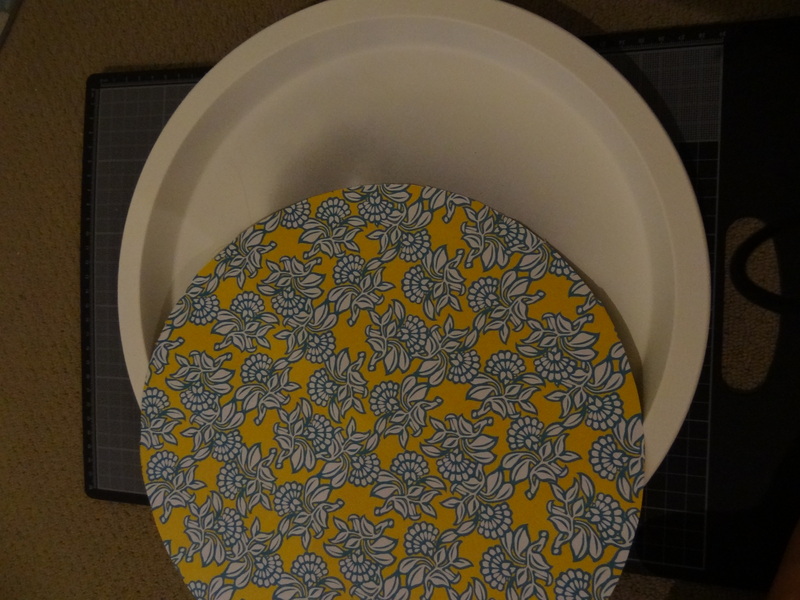 Cut the paper to fit the inside base of your tray. This will leave the painted edges of your tray exposed, hence the reason why there is no need to paint the whole tray. Using a paintbrush apply a thin layer of craft glue to the base and lay down your paper. Smooth out any bubbles and allow your tray to dry. 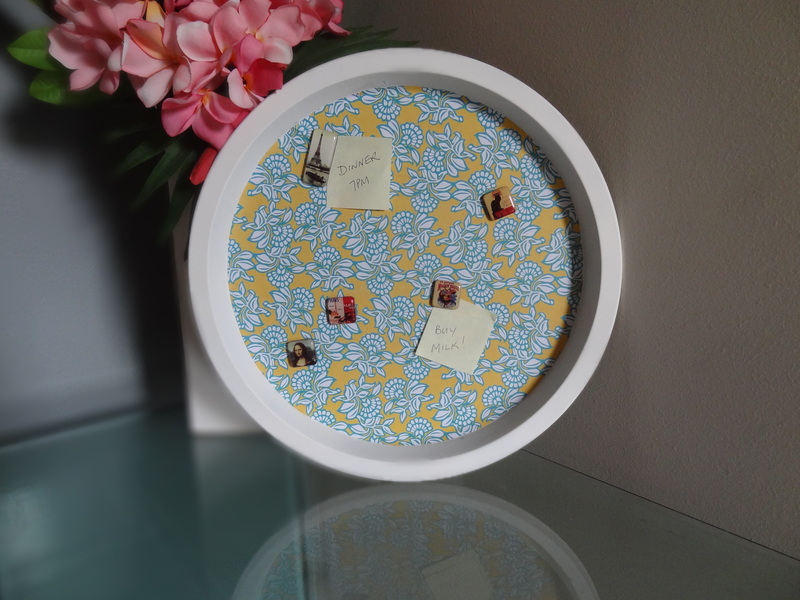 For this step I used a piece of scrapbooking paper and the cardboard label that had been attached to the inside of my tray, acted as a template to cut out my circle with a craft knife. This board looks great. No one would guess it was destined at one point to be a pizza tray. I could imagine that a whole display of these in varying sizes, and even shapes, in coordinating colours and papers would look effective. As for my magnetic board, it is destined to complete my command centre which I hope to share with you soon. I would love you to follow me via email or my Facebook page so you can see the board hanging in relation to the rest of my completed centre. 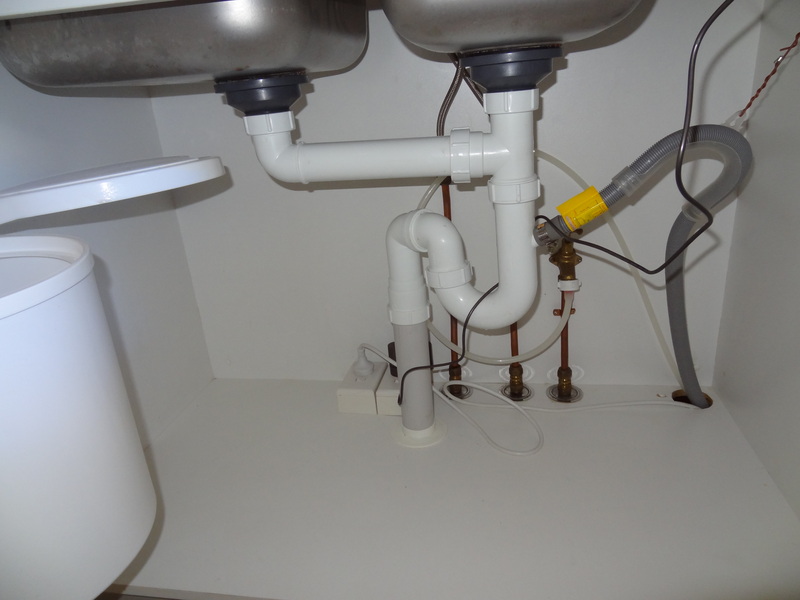 The other day I showed you the disgrace that was my under sink cupboard and how I went about cleaning it up. You can read about this here. Embarassing as that was, there is another place in my house that had grown worse – my hall cupboard. It had become so bad, so stuffed with junk, that the sliding door came off its runner the other day when I was trying to shut it. 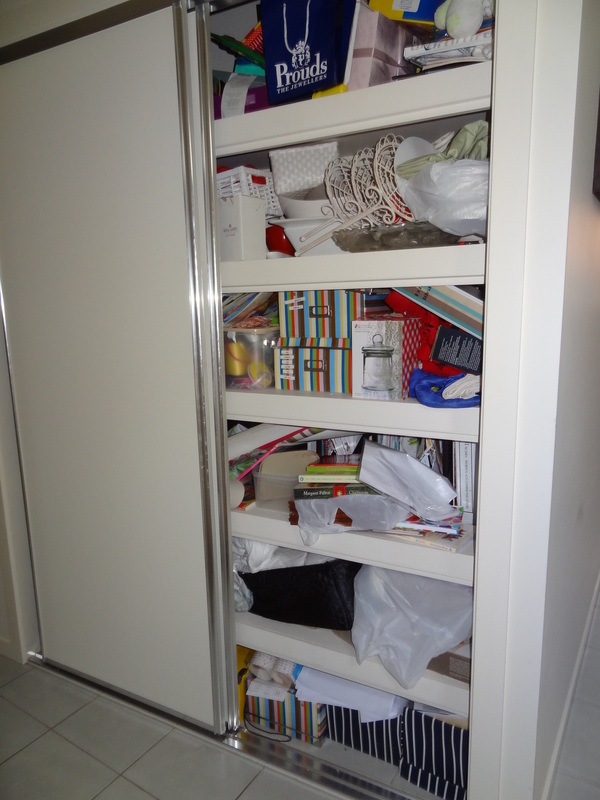 So this past week I spent two days – yes, two days – cleaning the hall cupboard. I probably could have done it in less time but I would not have got things as clean or as organised as I had wanted them to be. I planned to never let this cupboard get in this state again! This is what it looked like before I began the clean-up. 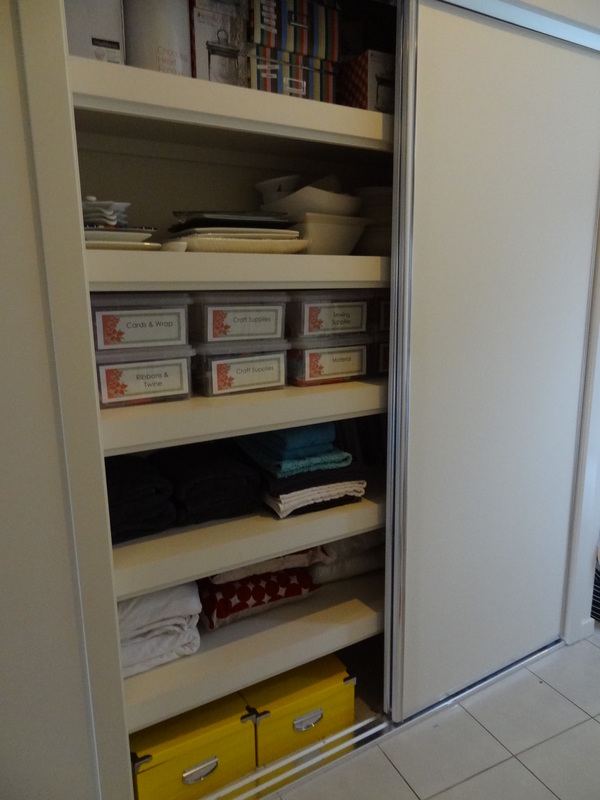 As a linen/storage cupboard it housed the overflow from all areas of the house. In particular it stored all my decorations, crockery and servingware for parties and most of my craft supplies. 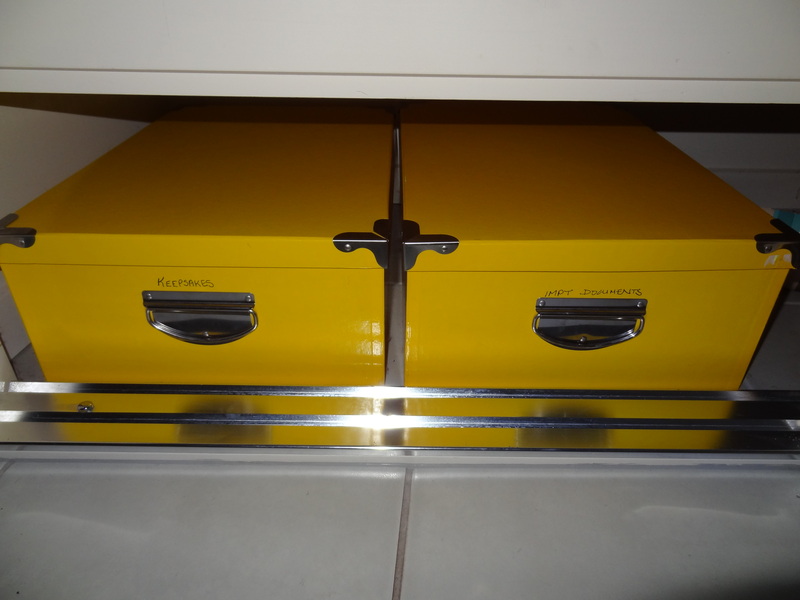 It also stored my gift collection – but more on that later. So how to you tackle a huge task like this? Here is how I did it. Before I started I pulled out three laundry baskets to help sort the cupboard’s contents. One for items to relocate, one for items to dump and one for items to donate. I started at the top and worked my way down, sorting the goods into the baskets. Anything I found that was to remain in the cupboard I laid out on the floor in groups of related items. I was ruthless. Anything that I had not used for sometime I got rid of. I quickly realised what a bottomless pit the cupboard had become and just how bad my baby brain wash in my last pregnancy. I found no less than ten presents I had purchased throughout last year in an effort to be organised for birthdays and surprise events but had forgotten about. I also found the supplies for numerous projects I had given up on because of lack of time or motivation. By the time I got to the end of this step I was thinking, “What have I done?” My hallway looked like something out the TV show ‘Hoarders’. I didn’t photograph this because I was just too embarassed. My son stumbled and was lost under a pile of doonas as he traversed the small path that weaved between the mountains of items. I was lucky I heard his calls for help. However, once I had thrown the rubbish in the bin, placed the items to donate in the charity box and rehomed items no longer needed in the cupboard, the task of restocking the cupboard neatly didn’t seem so onerous. I gave all the cupboards a good clean out with warm soapy water. 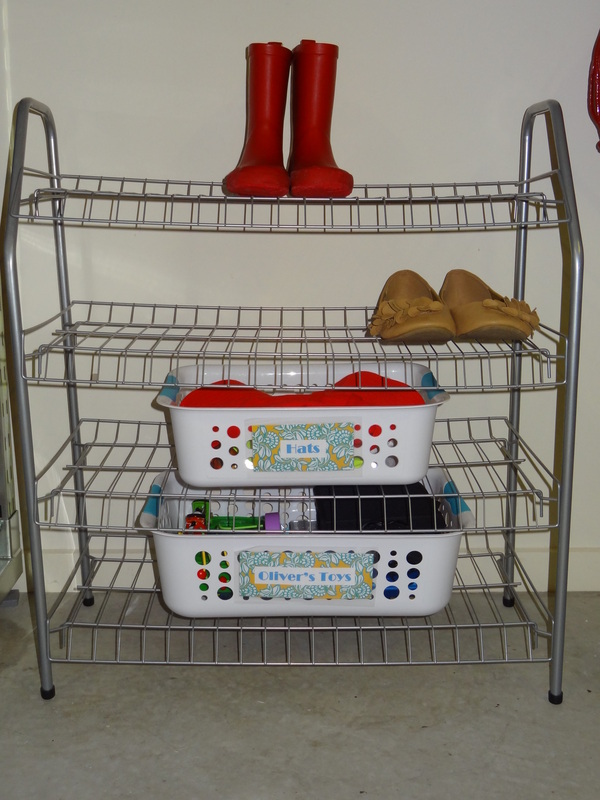 I looked through the items to return to the cupboard and determined their best placement and came up with storage solutions that would benefit the space and the item’s use. I made sure I had room to place commonly used items on easily accessible shelves. With heavier items like my platters I made sure there was room to space them out so that no stack became too heavy to lift. 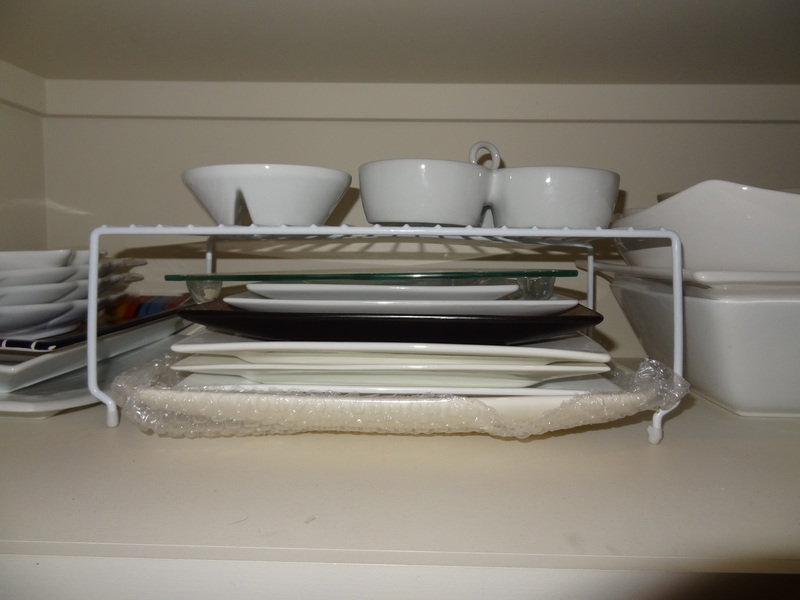 In the future, should my collection of serving ware grow, I can add a shelf rise like this to give me additional storage space without making items hard to access. I saw I had enough space to devote a whole shelf to my craft items. 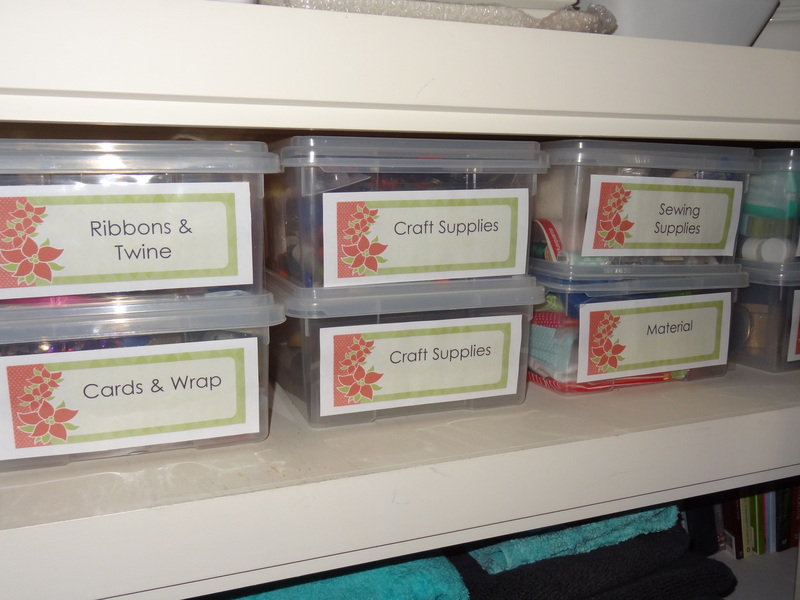 I decided it best to sort and store all my craft items in small boxes so they were easy to find and move when needed. I had already stored some craft items in 10 litre starmaid boxes and had found them stackable, durable and perfectly sized for my shelf height. I purchased additional ones after carefully assessing just how many i would need. I made nice, large labels for these to make them easy to find. I had been storing important documents and keepsakes in three small boxes at the cupboard’s base but they were overflowing. I was able to transfer these into much larger cardboard boxes that had housed party decorations I relocated to storage kept in the garage. I didn’t really want to spend money on a storage or sorting system for all the presents I had. By stacking them as compactly as possible at the top of the cupboard, I ensured they would never again be forgotten by creating an inventory sheet. To make it durable and to allow presents to be deleted when gifted, or added when bought, I laminated a piece of coloured paper to act like a whiteboard. I attached a marker pen to this sheet and secured this to the inside of the cupboard. 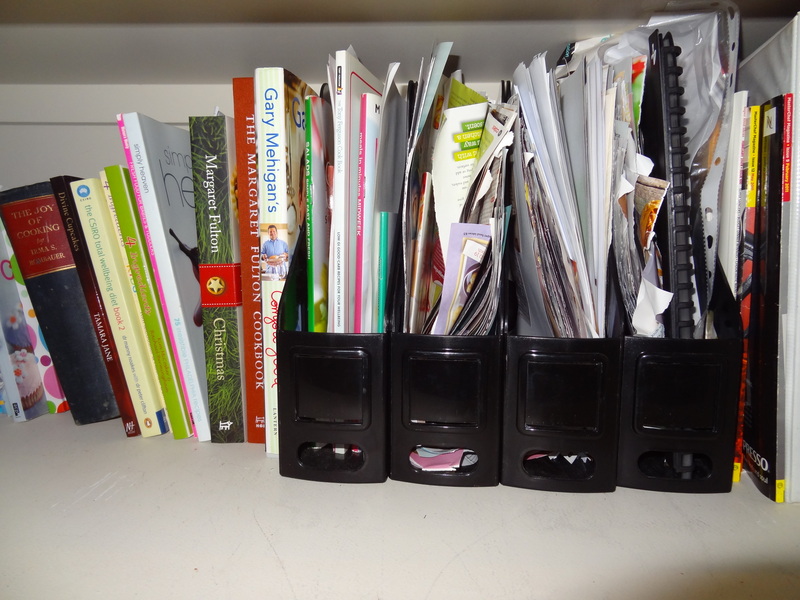 The cupboard had also come to store my cooking books and literally hundreds of recipes torn from magazines over the years. Organising these alone would require an effort greater than cleaning the cupboard. Realising I needed to research a system to organise these, I decided I would corral all the loose cuttings in magazine holders until another time. This took up more space than I would have liked in my cleaned cupboard but I had to put up with that. 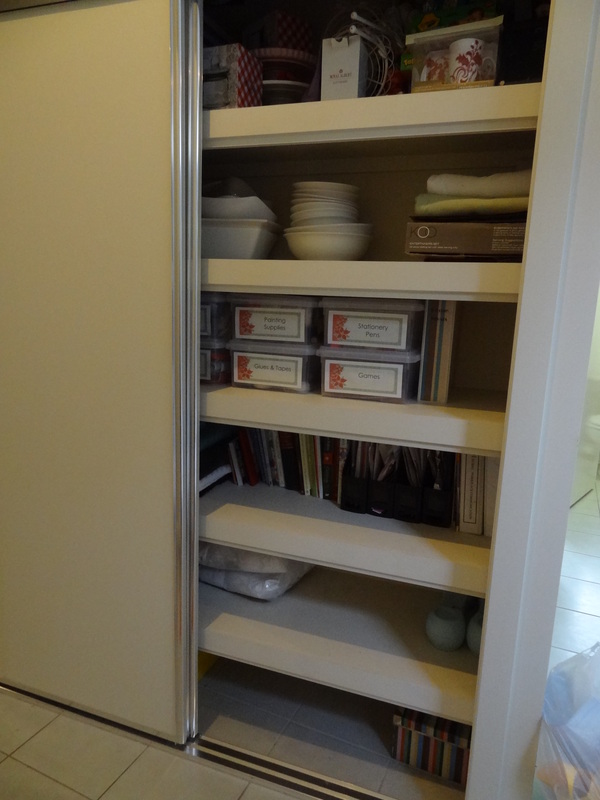 I replaced all the items neatly in the cupboard being conscious of making everything accessible and visible. I know I will have to make a concerted effort to maintain the organisation and neatness of the cupboard. By spending a few more seconds folding and stacking the towels I can ensure they no longer bulge from their shelf and by returning craft items to their box they will be easier to find. Completing this much needed task has been really worthwhile. Despite the fact it has thrown a few extra jobs my way, like filing my recipe collection, the house feels less cluttered. If you have any recipe filing ideas I would love to hear from you……Have a great week. 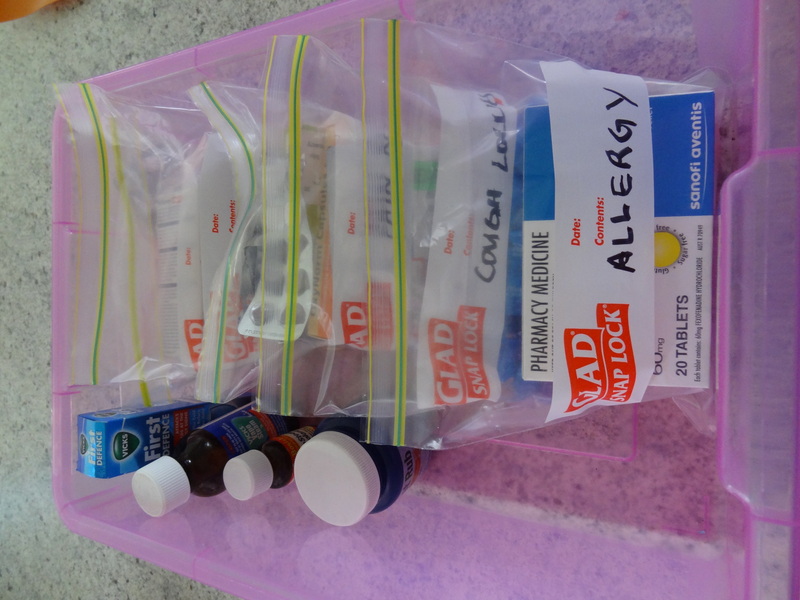 I had a little clean up of our medicines last night and thought I would share with you how I organise these. It is pretty effective. How do I gauge this you might ask? Well, nine times out of ten hubby can find what is needed without my input. Jackpot! 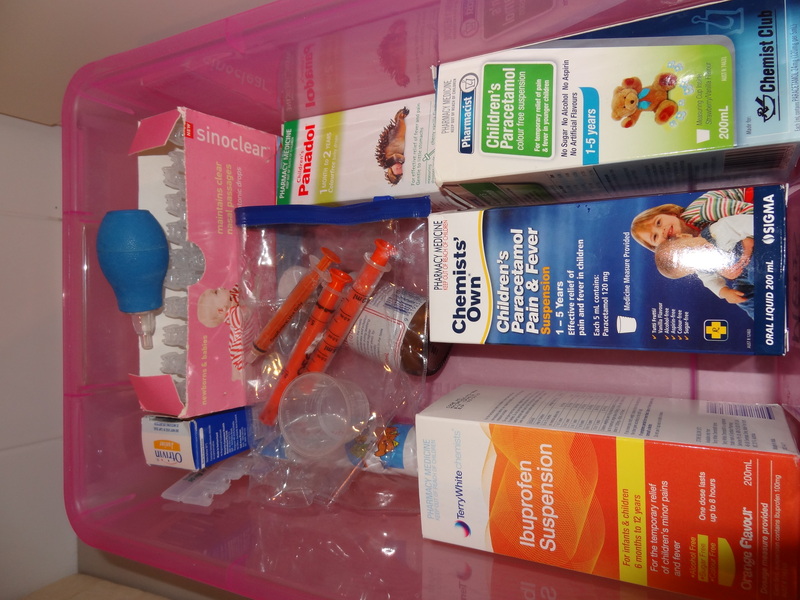 But the cold and flu/pain relief container has the potential to be really messy. The medications in here are grouped into zip lock plastic bags so it is easier to locate what you are after. 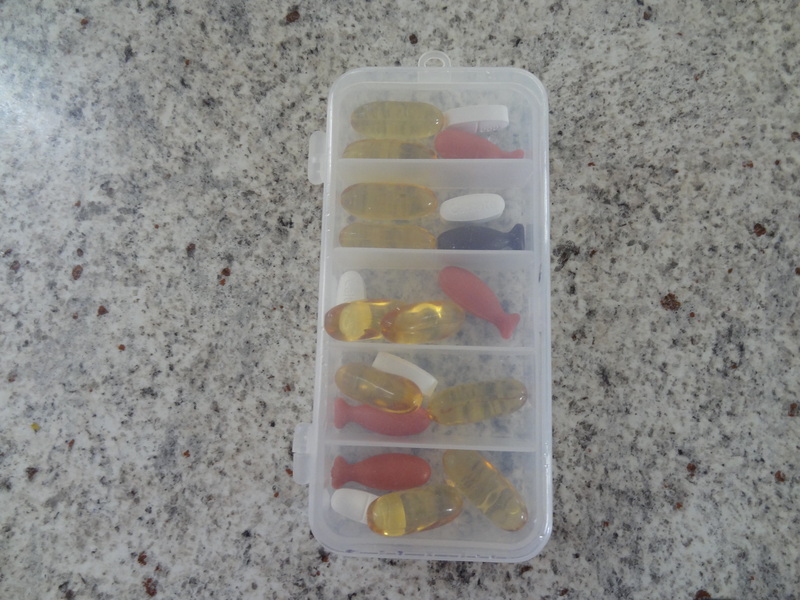 For our everyday vitamins, rather than having to go to these boxes everyday, I have a divided plastic container I turned into a pill-box. 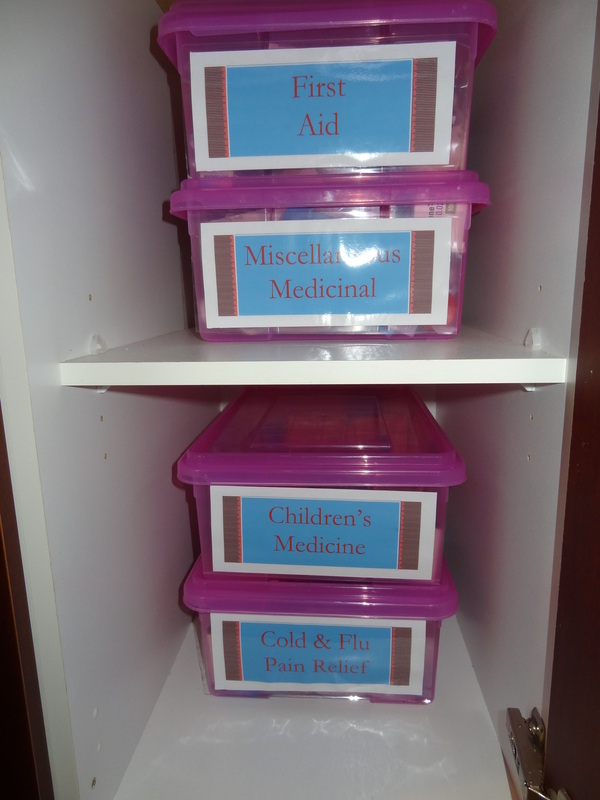 If you need to organise your medicines I hope this has given you some ideas. I’d love to hear how you manage your supplies. 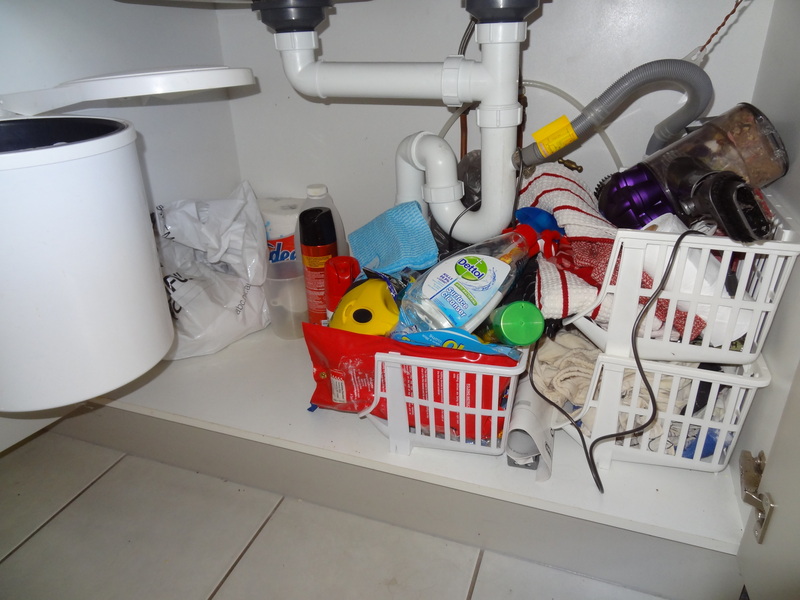 This is what my kitchen sink cupboard looked like a week ago. A jumble of cleaning products, plastic bags, tea towels and other odds and ends. It was a balancing act to take or replace an item to and from this messy tower. Something had to be done. Like many organisational and cleaning challenges undertaken in my household, it was a trip to Ikea that made me address this issue. It was here I bought the Rationell Variera plastic bag dispenser to replace the one that had broken in my house a year prior. 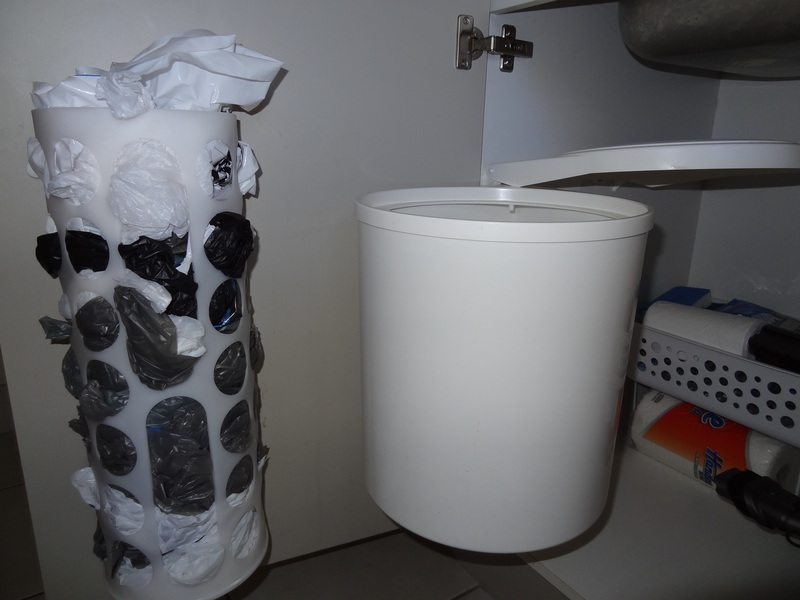 With my plastic bags now attached neatly to the door, I could begin the purging, sorting and cleaning that the cupboard needed. My first step was to get everything out of the cupboard and to give the inside a really good clean. This way I could see the space I had to work with. 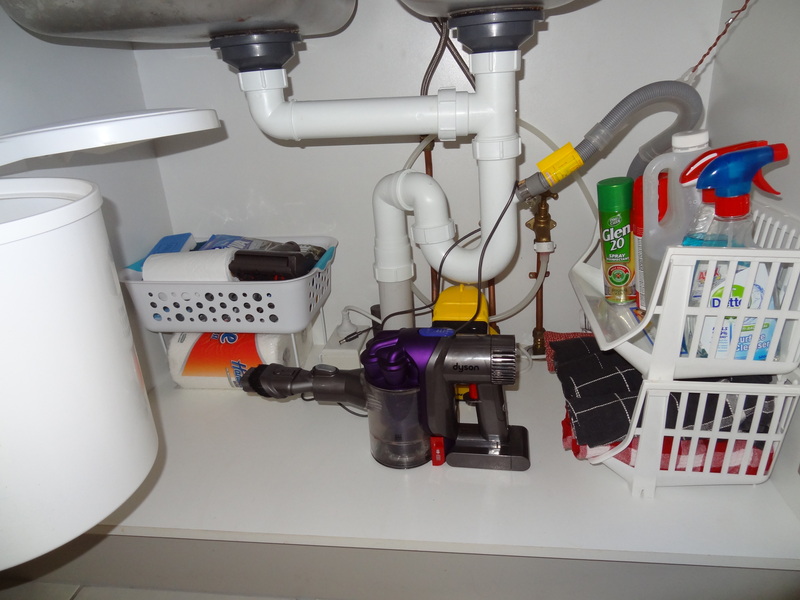 I noticed, much to my annoyance, that the different appliance cords and the dishwashing hose hitch were necessary messy items and space stealers I had to work around. Looking at all the things I got out of the cupboard made me realise it had become a bit of a dumping ground. Hidden in the back were craft brushes and cleaning products that don’t even get used in the kitchen. By returning these to their proper homes I could then sort through the items to stay. I also used this opportunity to retire any tea towels that were looking had it to my rags pile. Reusing the two tiered stand I had in there previously, I put my tea towels in the bottom and my cleaning products on top in easy reach. 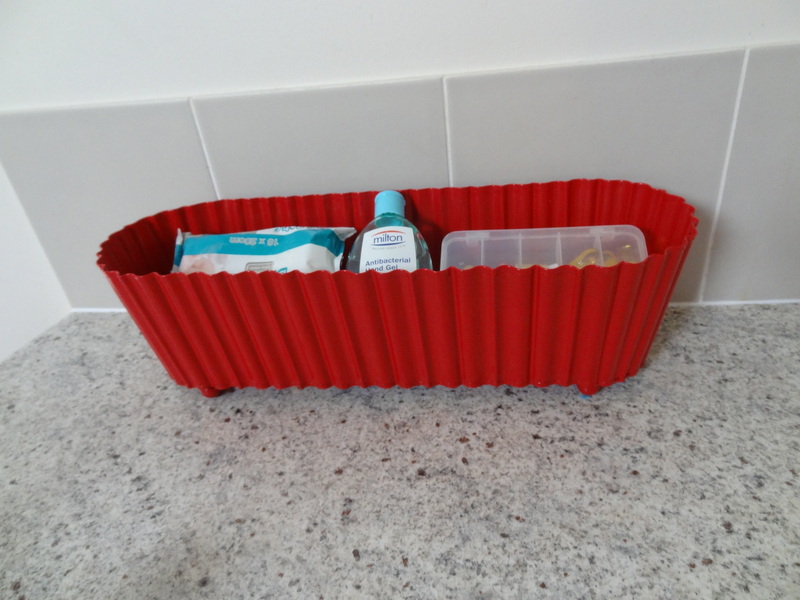 Adding a small shelf rise and cheap plastic basket, I had a place to keep my kitchen supplies like paper towels, bench wipes and rubbish bags. This left oodles of space to put my hand-held vacuum. It has thus far stayed neat but I suppose the temptation will be to fill the extra space with other stuff. Hopefully this post and the wretched before photo will shame me into keeping it clean.